If you are concerned about climate change and its environmental impact, but are too overwhelmed with work and parenting to envision solutions, this evening will provide concrete actionable ideas and a sense of community as we face this issue together. 6:30pm – Hear about woods and garden initiatives from Ian Jack and Nicole Palitti, BRS parents, and a short presentation of Making a Difference: Children and Community Water Advocacy with Laurie Seeman, artist and water advocate from Strawtown Studio. 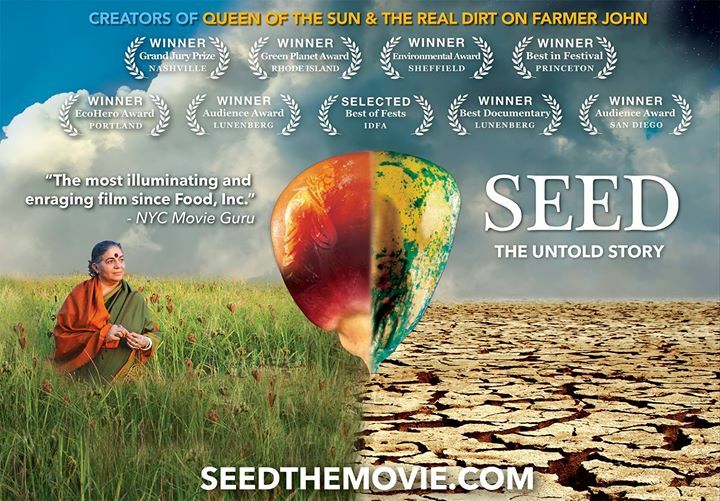 7-9pm – Screening and discussion of the movie Seed, The Untold Story: This award winning film follows passionate seed keepers protecting our 12,000 year-old food legacy. In the last century, 94% of our seed varieties have disappeared. As biotech chemical companies control the majority of our seeds, farmers, scientists, lawyers, and indigenous seed keepers fight a David and Goliath battle to defend the future of our food. Screening will be followed by a discussion and specific ways to get involved locally with your children to restore and preserve the earth’s precious resources. Open to all Blue Rock parents and the local community. Feel free to invite your friends! Suggested donations are gratefully accepted to support our Film and Education Series.